Service “A la carte”: We purchase goods on your behalf and resell them to you with a payment cycle that allows you to be paid by your customer before you have to pay our invoice. This service is flexible allowing you to choose whether you wish us to also manage inbound transportation, customs clearance, logistics co-ordination etc. 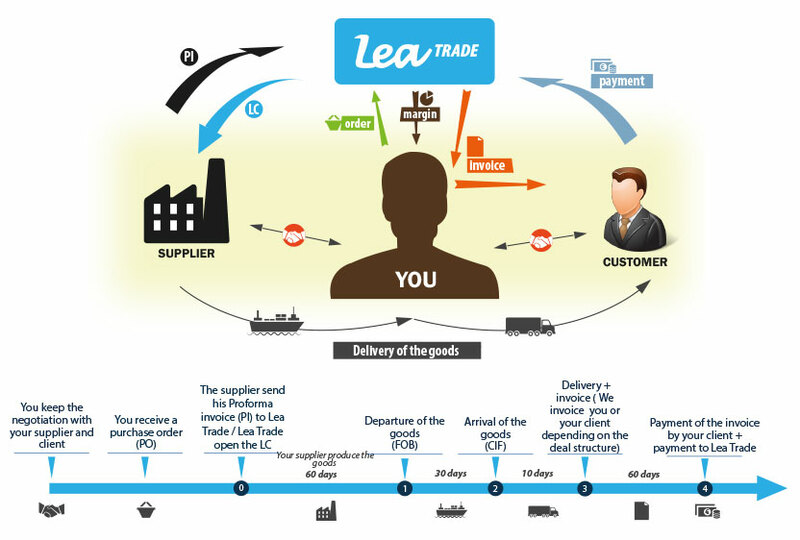 Service “Trust”: We purchase the goods on your behalf with an order from your end customer issued to Lea Trade. We invoice your customer, collect the payment from your customer and repay this to you minus the cost of goods and our fee. Service “Peace of mind”: We provide a complete end to end distribution solution. This includes the purchase of the goods; arranging logistics, transportation and customs clearance; delivery of goods and invoicing. We are paid directly by the end customer. Our knowledge of the SME market enables us to quickly understand your business and its expectations. Our fast decision making process enables us to provide you with an answer within a week.